Available at Variety Book Depot, New Delhi, @ 2400 roupees or approx. $45 US. 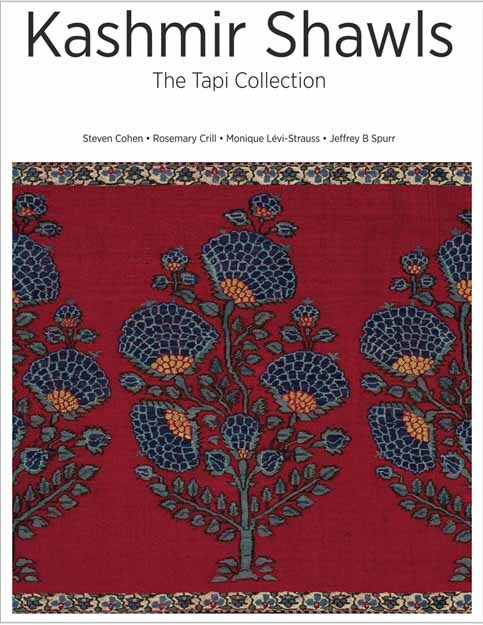 With exacting taste, a keen eye and the substantial means to go about it, Praful and Shilpa Shah of the Tapi Collection of rare and historic Indian textiles, have relentlessly, over the past few decades acquired some of the finest Kashmir shawls ever produced. With the arrival of their long awaited catalogue, a weighty tome in large format, shawl enthusiasts now have something substantial to add to their library. For this reviewer, former owner of many of the great pieces in the collection, it was a chance to reacquaint myself with old friends. Steven Cohen, an independent scholar with a long list of publications to his name and often a feature writer for Hali Magazine has over the years often brought a fresh innovating perspective to the way we look at, enjoy and interpret textiles and Oriental carpets. His ability to clear away ambiguities and apocryphal misconceptions that frequently arise in this area of study has brought a breath of fresh air. So, it is that with pleasure and anticipation I found myself with his latest publication in hand, knowing that reading Cohen’s logical and perspicuous prose will once again hold in store some new learning experience. But before getting carried away, let’s see what we have. He opens his chapter informing us of what has been missing in all the other books on the Kashmir shawl: proper measurements of weights, warp and weft counts and pattern sizes. This is so true. Few authors, including myself, have had the time, money or facilities to properly undertake such detailed measurements. However, Praful and Shipa Shah, textile magnates of India, have it all including the passion and the yearning to dig deeper into the subject’s science. Cohen adopts the systems of measurements first established by Beardsley and Sinopoli in 2005 (Museum of Anthropology, University of Michigan, Ann Arbor), whereby each shawl was weighed for its relative weight to area ratio. Thus, we have the gpsm or grams per square meter, which he assert is the “single measurement which best expresses the relative [shawl] quality”. But is the gpsm really the “impartial way” to prove “relative quality”. When the first kani shawls were woven say back in the early part of the 17th century can we really know for sure that, according to Cohen’s argument, “the original goal of the Kashmiri weavers was to produce the warmest, softest and lightest weight shawls”? At first blush the gpsm data appears to be quite impressive and so I decided to take it for a dry run. Turning to Plate 1, Tapi’s only 17th century shawl, a pallu fragment whose provenance I’ve always found a bit troubling due to its large double row of butas and abnormal use of black wool. 17th century shawls are of course characterized by a single row of butas within a narrow pallu. A double row of large butas is virtually nonexistent. Furthermore, besides Plate 1’s offbeat coloration, the reason black wool is not used is because over time it oxidizes and disintegrates. It’s therefore employed very sparingly, as perhaps in a thin outlining of a flower. Checking the book’s handy “Statistics Chart” at the back, which organizes all the data of weights, sizes, warp and weft counts, etc. we see that the warp/weft count for Plate 1 is 31-38 x 46-56 per square cm. Normal. But, its gpsm, 150, is 2.5 times higher than all the other fine early shawls listed in the catalogue such as in Plate 10 (61 gpsm), Plate 17 (65 gpsm) or Plate 12 (66 gpsm). In fact, 150 is in reality, incorrect; most of the extensive use of the black thread is visibly gone. Assuming the shawl has been washed, the true gpsm is really much higher. Based on this data alone some key questions arise. Was the fragment woven with pashmina? Was it woven outside of Kashmir? Or, is it a late copy? So I turned to the book’s nifty “Comparative Appendix” (CA) where each of the 133 Illustrated shawls is, using postage-stamp color photos, compared to similar pieces from various collections around the globe. It just so happens that exactly the same buta design is found on a pair of shawls, one at the BKB (Bharat Kala Bhawan, Benaras Hindu University Museum), the other at the NM (National Museum, Delhi)- and both tiny photos are there in the CA. Guess what? No visible black wool. In fact, I was surprised that this fact wasn’t mentioned in the appendix’s blurb. But now my dry run is telling me that in order to complete the picture we need to know the height of the butas which we can sort of figure out given the noted pallu height of 26.9cm-given also that the floral shrubs are the same height as the ones on the shawls at the BKB and NM-, also listed in the CA. But for the NM & BKB shawls, of course, it’s not there. Perhaps one day the NM will do a catalogue raisonné of their own collection with all the appropriate data. So at this point we don’t know if, despite Plate 1’s double row of butas, whether they are the same height as the aforementioned pair. But we begin to suspect, black aside, that Tapi’s scientific data tend to belie the shawl’s chronology. Cohen himself states that “excessively high weight arouses suspicion of a provenance outside of Kashmir”. But this last statement we’ll address further on. Returning to weight measurement. Because we don’t know the gpsm of the BKB and NM shawls’ pallus, we have no data for comparison. So what does this tell us? Right, pallu weights are indeed necessary. And this is especially true as so often is the case in many collections of early shawls where only the pallu remains. With few exceptions most shawl of the 17th and 18th century have large plain fields; often the lopsided (heavy kani work with large plain fields) Sikh period ones, too. Although a shawl’s overall weight can be useful, knowing separate weights of the plain woven pashmina field and the kani woven pallu would provide more precise data for comparative studies. This brings us to Cohen’s conclusions on warp and weft count which I found a bit troubling for several reasons. First of all he states that “If the weight approaches 300-400 gpsm, regardless of their weft count, the shawl was most probably not woven in Srinagar and was probably not woven entirely of pashmina, either”. He then goes on to strongly suggest that Plates 68 (413 gpsm), 75 (380 gpsm), 106 (443) and 71 (434 gpsm) “must all be considered to have been produced outside of Kashmir, simply on the basis of their uncharacteristically heavy weight.” Plate 68, I totally agree. It’s a moon shawl with flat, unattractive colors and it was most likely woven with a mix of Kerman or Merino wool, perhaps in Amritsar. For Plates 71 and 106 there is an obvious (pesky) typo (p.13). Instead of 434 and 443, their weights should be according to the Statistic’s chart -and their captions as well- 283 and 190 respectively. But typo aside, one look at the striped moon shawl in Plate 71, and immediately we see un-Kashmiri coloration and weak design and it’s clear that it’s not from Srinagar. So far, so good. On Plate 106, however, I completely disagree. It’s another sparkling example of delicious Kashmiri color-tones and a weaving surely done in fine pashmina. To suggest that it was woven outside of Kashmir is nonsensical. Also, Plate 75, a long shawl of breathtaking beauty, sparkling colors, superb weave. As its former owner and therefore someone having had intimate contact with it, it’s inconceivable that it was woven with anything but the finest pashmina or in any place else but Srinagar. It’s quintessentially one of the best weavings of Kashmir. In studying the Statistics chart we also see that Plates 73-78, 80-82 and 84 also have gpsm of 300-400. To anyone who’s been collecting Kashmir shawls it’s obvious they’re all beautiful and rare examples of the finest Kashmir weavings. If Cohen really believed they were woven outside of Kashmir, he certainly didn’t say anything about it in their captions? Yet he most decidedly highlights it in Plate 68’s caption, the lackluster moon shawl, that “The provenance of this shawl is uncertain. It’s increased weight suggests that it has not been woven entirely of pure pashmina…”. Something’s amiss in Denmark! In the next section of Cohen’s chapter, “What is a Kashmir Shawl,” he brings us a stimulating intro on pashmina and the animal it comes from. The finer the wool the warmer its quality due to insulation of the body’s heat trapped between the extremely fine fibers. I was unaware that the finer hairs found in pashm wool are composed of solid keratin as compared to the longer thicker ones which are hollow in nature. In comparing rare animal hair diameters from various known species, we learn of a new animal called the qivuit, a musk ox from Northern Canada, Alaska and Greenland, whose hair diameter is on par with the finest shah tus: 10-12 microns (Rizvi gives it as 9-12). And here Cohen alludes to a very important point and one which heretofore has not been mentioned: Normal wool fibers are scaly and have hollow centers and as such take dye less evenly than solid pashmina fibers. This fact is undoubtedly what gives the shawls of Kashmir their unrivalled sparkle. In days of yore the pashm, after it was picked through and separated into it’s various shades of solid color, was then hand spun using a drop spindle which was capable- according to the testimony of early travelers into Kashmir- of making “unbelievably fine uniform threads”. The finest spun wool of today still cannot match that of the drop spindle of a century ago. This and proper natural dyeing are two of the principle impediments to replicating shawls of the past. In the remaining sections of this enlightening chapter- and this is where Cohen’s perspective and knowledge shine- his narrative nicely unfolds the origins of the kani weave, loom and the ancient references to goat hair. One last word on the columnar Statistics chart at the back, I found it strange to find some warp and weft counts listed under a label-less column while others appeared to be in the right place. What I enjoy about it is having at fingertip all the sizes, making it easy to determine if a shawl has been reduced. Strange that Plate 45, a fragment, is listed as being a full shawl. Concerning the dating- always a tricky thing- I would proceed with caution since I found that the dates lean rather too much on the late side, perhaps modestly so. Jeff Spurr’s long chapter discusses with the aid of Indian painting and European fashion plates, the development of the various shawl patterns as they developed from imperial Mughal times up until European markets demands of the 1830s. However, if Cohen’s chapter is thought provoking and clearly written, Spurr’s is tedious, tendentious and dogged by errors and misguided references. In attempting to lay out his own plan for understanding shawl design, Spurr launches into an unnecessarily complex, cumbersome and idiosyncratic system of labels for every shawl body part he encounters such as “phase 1b ,2,…”, “mode 1,2,…”, “style 1,2, …” and “type 1,2, …”. Definitions are vague. “Phase 2” for example is introduced (p41) without prior definition. Under European Market Style, “phase 1” has no image (p56). In case the reader is not frustrated enough with having to recall the dozens of labels (some frivolously appended), he then introduces as style label subtypes (pp 47-49) which become “second type”, “third use” or “application of ideas” or “function”. In discussing a shawl in a painting (p48-49) whose zanjirs/hashias (borders) are completely blurry, Spurr declares them a “late version”. From an illustration in Journal des Dames of 1829 (p43) he confuses an obviously French floral pattern for a kani weaving. Again, he mistakenly considers a narrow-hashia patka (p35) for kani pashmina (“bearing the hallmarks of early Kashmiri work”) and then contradicts this observation in the next paragraph by saying that all early patkas have broad borders. In describing another patka (p.31) as “entirely decorated with geometric patterns”, it’s obvious he has not even looked at it: the whole field pattern is of scrolling vines and leaves. Although not one kani narrow (read: a pallu of one buta) patka from the 17th century is known to exist, Spurr, states that patkas were the first kani products to be woven (p.35). Moreover he continues on the same page with the statement, “no Kashmir shawls have survived that retain the quasi-naturalistic character of the early patkas…”). Again it’s obvious he hasn’t read the published material. If anyone, Rosemary Crill, curator at the V&A, should have immediately picked up on this since her own museum’s famous publication of The Kashmir Shawl by John Irwin- the sine quo non of shawl literature which every new student of the subject must study- illustrates one of the great high Mughal butas of the early 17th century, which surpasses the label ‘quasi-naturalistic’ in character! Perhaps the most blatant, though, and one which seriously belies Spurr’s familiarity with the subject is his unabashed proclamation that only one complete shawl from the 17th c. survives (p.40) where in fact many are known. Besides the one he cites at the MFA, for complete shawls I can name least three at the BKB, two at the TM, one at the V&A, three at the Guimet, one at the Fondazione Ratti, two at the Calico, two at the NM and one in a private collection, as a start. Spurr claims that the “millefleurs” style boteh is a phenomenon of the late 1790s. In fact, it dates from close to the mid-18th century proof of which can be clearly seen on many dated Zand paintings. His discussion of the Persian Market is unfortunately (perhaps fortunate at this point) given scant if not careless attention. In stating that “its demands never dictated the development of a new style”, he blaringly overlooks published research (Hali,139) establishing the Qajar (1798-1925) and Zand Dynasties ( 1750-1794), as perhaps the most avid enthusiasts of the Kashmir shawl long before Europe. If you’re still with me, hold on, there’s more to come, although by now you’re probably getting the message. How the editor missed all these errors is beyond me, but I’m jumping ahead of myself. Let’s try to get through his chapter first. Plate 4 of the catalogue features a magnificent, long, complete, white field shawl with pallus of intriguing polymetric units which are highly geometricized. At the very least, the overall feeling is one of stupas or the Far East; a very rare animal indeed. Nothing like it out there in the world of kani weavings can compare. I’ve known this fantastic shawl for years, have studied and written about it, but Spurr however, compares this style with that of a shawl whose pallu illustrates 150,000 woven blue dots. Readers, it doesn’t get much better than this because at this point I’m not sure if Steven, my hero, has forsaken me or was submitting to pressures beyond his control. In his few paragraphs on Hashias & Zanjirs, p.42, Spurr points out that in Plate 5 the zanjir is an older version of the one in Plate 12 although it’s obvious they’re both the same. But he claims that the older version has five petals while the later version, three (it doesn’t: clearly it has five). By the time we come to page 53, and having not much else of importance to speak about, it was now time for him to take a pot shot at this reviewer by shamelessly repudiating the influence of the Sikh Khalsa movement’s influence on the Kashmir shawl. He attempts to illustrate his point with a painting of the General Allard and his family. Since three of the women are wearing plain shawls and Allard is wearing a striped one but not a Sikh patterned one, Spurr believes that this is evidence enough. Well, guess what is flagrantly missing in his diatribe? You guessed it: August Schoefft’s famous painting of Maharaja Runjit Singh’s durbar gathering, showing quintessential Sikh period shawls hanging from the palace’s mihrabs and similar types being used as saddles and shoulder mantles. He then proceeds to speak about a very important shawl the Shah’s had acquired from me several years ago. The shawl represents a direct link to the cremation ceremony of Runjit Singh in 1839. Why? Because boats decorated with pennants and garlands can be seen distinctly in the weaving and they match exactly the boat illustrated in a contemporary Kangra painting documenting the actual event, painted according to Archer, in 1840. It’s impossible not to see the similarities. However, Spurr has chosen to state that it was woven before 1839! I know for a fact that Spurr’s manuscript upon submittal was immediately rejected. It had many problems. This is all I know. And now reading through it, it’s obvious why, but I’m at a nonplus to explain how so many errors, facts, erroneous references and blatant disregard for published research made it into the final text right under the noses of such expert co-authors. Upon learning that Hali would be inviting me to review the book, Steven Cohen was obviously apprehensive when he wrote to me. He explained that because of so many changes in the aesthetics he had hoped and worked hard for, he was extremely unhappy with the final results and felt he had to divorce himself completely from the publication. My suspicion is that his rejection of the book had little to do with aesthetics and more to do with Spurr’s fiasco. Rosemary Crill tackles with aplomb an exciting chapter on the embroidered shawl, the heyday of which took place during the second quarter of the 19th century. The industry is credited to the rafugar Ali Baba who began his practice almost a century earlier. However, the fine darning work did not reach its florescence until the 1830s, writes Crill. Today it is well known that the expert darners (rafugars) – of Sunni extract- come from Najibabad, UP who of late have become major players dealing in the antique ones. Crill’s essay focuses on a spectacular 1830s shawl with over 200 figures of animals, horses, soldiers, sadhus, simurghs, etc. imbibed with a Hindu-Persian flavor. Although little is known about these types of popular pictorial types, Crill skillfully assesses the nature of their iconography through the lens of Persian literature and generous reference images. Today in India, one of the most coveted and sought after shawl is the Dorukha, the reversible shawl. Instead of double-interlocking wefts as in the kani shawl, it employs a single-interlocking method, much like Chinese K’ossu silks. Many stunning examples are illustrated in the catalogue as well as the Doranga type which is similar to the former but possesses a ground color change on one side through the use of a couching-stitch embroidery. Because the stitch is so well done, following the twill weave of the fabric with perfection, it’s impossible to see that it’s embroidered, so well it blends in with the design. I have always wondered, and I’m sure others have to, just how this stitch was applied. Seeing a good diagram of how this eye-popping technique was done would have been a real treat since heretofore no other books on the subject have explained it. In fact, knowing that the Shah’s had previous mounted an important exhibition of reversible shawls, a few years back, at the Prince of Wales Museum in Mumbai, I thought for sure a good diagram would have been included. Monique Levi-Strauss explains in her brief chapter on European shawls that when Napoleon’s Continental Blocade in 1806 cut off the supply of imported Asian pashmina manufacturers switched to fine sheep wool wefting and silk for warps. To achieve a better imitation, the glimmer of the silk was hidden by a 3 & 1 twill structure. Due to the fragility of European wool, manufacturers, in order to weave high quality shawls, spun warps with a silk core wrapped in pashmina. Collaborating with them were two of France’s best known artists: Amedee Couder(1797-1864), who “blazed a trail by introducing monuments, persons and animals…” and Antony Berrus (1815-1883), who ran a huge atelier in Paris and whose artistic style was inspired by exotic foliage; his drawings were sold throughout Europe. Two major exhibition shawls are illustrated: one attributed to Jean Deneirouse (JD)- which I called the ‘Dream Window’ in my book- for the Universal Exhibition of 1851; the other, a procession shawl by a Monsieur Pin for the Universal Exhibition of 1867; the later woven with warps of silk and wool. What would have been nice to see is an exploded diagram illustrating just how- and this is something that has always intrigued me- one is able to take a thread of silk and wrap it with wool! That Jacquard shawls were made in series of six; square ones, ten, is a little known but very important fact, claims Lévi-Strauss. Thus, if seven are known, at least twelve were woven; the Pin procession shawl being a case in point: twelve at least were woven because I know seven are still extant. Concerning the Dream Window (DW), as much as Levi-Strauss continues to attribute the design to Deneirouse- without supporting proof or valid argument I might add- I remain convinced that it was from the gifted Industrial artist Amédée Couder. I have no problem accepting that the tiny initials, DBC, found in the shawl, stand for Deneirouse, Boisglavy et Cie and that the jury for the Exhibition of 1851 handed them a medal for a new Jacquard loom process, “by which, with the usual colors, a great variety of tints may be made by combination of different threads in the weft”. Fine. For one, despite the variety of tints, the DW does not exhibit the “usual colors”. Two, compared to Couder, Berrus and others, Deneirouse – apart from his technical book on Jacquard loom engineering- has left us with no shawl designs. If he was a shawl designer no one has a clue as to his style. Although Levi-Strauss, in her latest book (Cachemires 2012) states categorically that nowhere in the literature or annals of French exhibition history is JD mentioned as having designed a shawl himself, yet she continues to “deduce” (“nous deduisons”) from some mysterious source that JD was a shawl designer. JD had excellent mechanical skills. He rose from a laborer’s job working for Lagorce and later on engineered new loom patents (‘nouvelle armour’ & papier pointe briquete, for example) that revolutionized the Jacquard loom. He lived and breathed the minutia of mechanical intricacies of the Jacquard loom. it was by dint of these talents that he rose in stature within the elite hierarchy of shawl manufacturers. JD formed a very rewarding association with the Gaussen family for years. For a guy who dreamt day and night of inventing new ways to speed the process of the ‘espouline’ technique, the Indian weave, the art of shawl designing was not his thing. In sum, he was a nuts-and-bolts loom engineer and a great one at that! Three, that Couder was a well-known architect is evident in his ground breaking masterpieces, the Isfahan square shawl of 1834 (signed in the weave) and his procession long shawl, the Nou Rouz, of 1839 (unsigned). JD and his partner Gaussen wove Couder’s fabulous architectural designs because they had the technical know-how. Very sophisticated ideas are clearly visible in the DW. Those toward the shawl’s center one can see a strange pattern of large rosettes with smaller satellite rosettes. This relates to architectural blue-print drawings showing the foundation of a building. But the same idea can also be seen in earlier French shawls of the 1820s. For examples the running mihrab pattern of Couder’s 1823 Exhibition shawl (plate 53, Ames, 1997) and the strikingly similar rosette design on a square shawl seen in plate 63, page 148 of Ames 1988. Four, a shawl (DW) of such monumental proportions and virtuosity surely would have been mentioned in the jury’s comments by more just a few words about tint and thread. Jean Baptiste Amédée Couder (1797-1865) was not only a great industrial designer and architect but also, much like his well-known brother, Louis-Charles, a prize winning artist and writer. Both wrote on their respective fields with considerable authority and respect. Couder’s “Architecture and Industry as a Way of Perfection” was a high-minded manifesto on the moral and religious prejudices of man vis-à-vis the burgeoning virility of man’s newly found industrial powers over Mother Nature. For me, the Dream Window with its dramatic, exotic-even romantic- mystery, vaulting arches and stunning monumentality is not only a soaring reflection but a graphic ideologicalization of the philosophy propounded in Couder’s writing. In sum, KASHMIR SHAWLS, stark but necessary critique aside, is a big leap in the right direction. Eventually the technique of weighing shawls will and should become more sophisticated. Curators unfamiliar with shawls as well as seasoned collector will, with the help of the gpsm (despite its debatable precision) and the invaluable warp/weft data, will find it extremely useful in assessing their own collections. The beautifully assembled Comparative Appendix nicely ties in postage stamp images from world collections, pallu measurements and important commentary. But above all, Kashmir Shawls is a lavish visual repository of dazzling new shawl images never before published.